When you decided to explore the possibilities of an e-commerce business, you will start with thinking about how you are going to make your products or services available to the internet users. Joining the market places is certainly one option you could explore, but first, we will focus on having your own website with an online store. For big businesses, having their own e-commerce website is a crucial step. Alternatives do exist and offer plenty of exciting opportunities, but having your website helps you with creating a compelling presentation, a brand and an image that you want your business to be identified with. Regarding having an e-commerce website, you will need to explore different solutions from website hosting to e-commerce integration, shopping cart, and payment gateways. First things first, you will need to create a website. The most common choice is choosing one of the CMS (content management system) platforms. Platforms such as WordPress, Joomla, and Drupal, host a large percentage of websites. All of these platforms are free. They are mainly popular because they are quite simple and straightforward. You do not need any coding experience because all the features are already built-in or available as plugins and extensions. Other things that can be very helpful is provided documentation, resources, as well as the community of those using the same platform to exchange experiences. Furthermore, CMS platforms are usually up-to-date with the current industry standards, which means that they are SEO and mobile-friendly. All of the pages, apart from the shop, are created on the actual platform you choose. When creating each of them, think about best SEO practices and how to optimize each page to make it SEO-friendly. When it comes to the actual store, this is the e-commerce section of the website which requires e-commerce platform integration. Choosing one over the other platform is a matter of preferences, business needs, and budget. In the following chapter, you will find suggestions on the most popular e-commerce platforms at the moment and what kind of features you can expect from each of them. To make the store fully functional, you will have to integrate specific features that enable the online buying process. Sometimes, these features are already available as a part of the platform itself, but some platforms will require additional installations and integrations to make everything work. Product information has a huge impact on the performance of your website, on your ability to engage the visitors, to convert them into customers and eventually complete a sale. The way you present the product can make or break your business success. Choose a descriptive product name that the customers can easily find and relate to the actual product. Avoid using too many random capital letters or numbers. Although this might be helpful with tagging product for your purposes, the customers can only find it confusing. Images are necessary for an e-commerce website. It is enough for customers that they are unable to feel the actual product, but not seeing it as well means that they will probably be reluctant to buy at all. Product images should be very vivid and depict the features correctly. E-commerce websites usually provide a couple of images for a product (for example, product in a box, unboxing, product in use, etc.). The description should provide more information about the product or service. It is a piece of text that provides more details, highlights particular features or explains how the product is applied, used, etc. The purpose of this text is for the viewer to get more familiar with the product features and how buying this product can be useful and practical. The length of the text should be optimal because you do not want to overwhelm the customers with irrelevant text. Since this text is also helpful in terms of SEO, it can be quite useful to have more content in the product description. After all, this is the segment based on which the search engines are going to index and rank the page. However, always have in mind that the page (and its content) should be user-friendly. If the content is completely redundant and repetitive, you should not add it just for the sake of the search engines because this can have a negative influence on user experience. Additionally, it is recommended not to use the same product description for the multiple products. 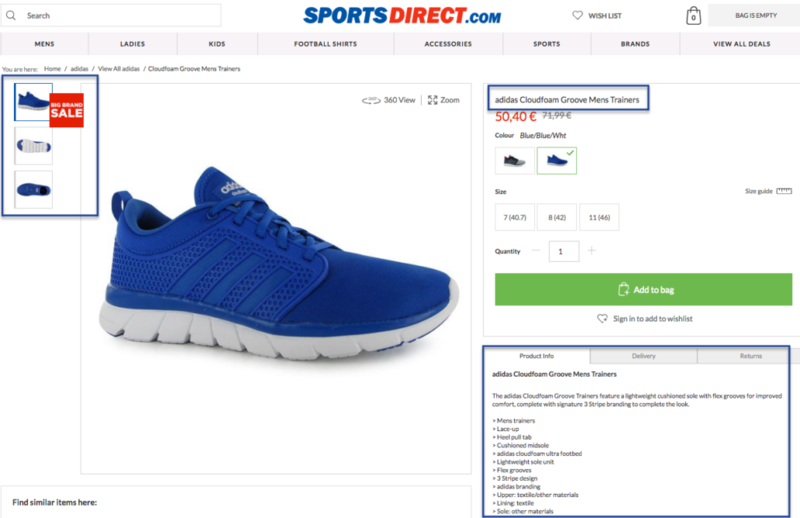 Despite the fact that it might be easier, and sometimes logical to do so (for example, you sell several types of running shoes with similar properties and design), you should avoid this practice. Firstly, because of your customers, but more importantly, because of the search engines. Search engine crawlers will use your website content (including product description) to understand how to index it and when to show such content as a response to a user query. Using repetitive product description will make this job more difficult for them. Those and similar information can be provided about the product if you believe that this information would benefit the customers and provide a better user experience. Finally, the button that directly leads the customer to the next step, to the shopping cart, is the most prominent one. 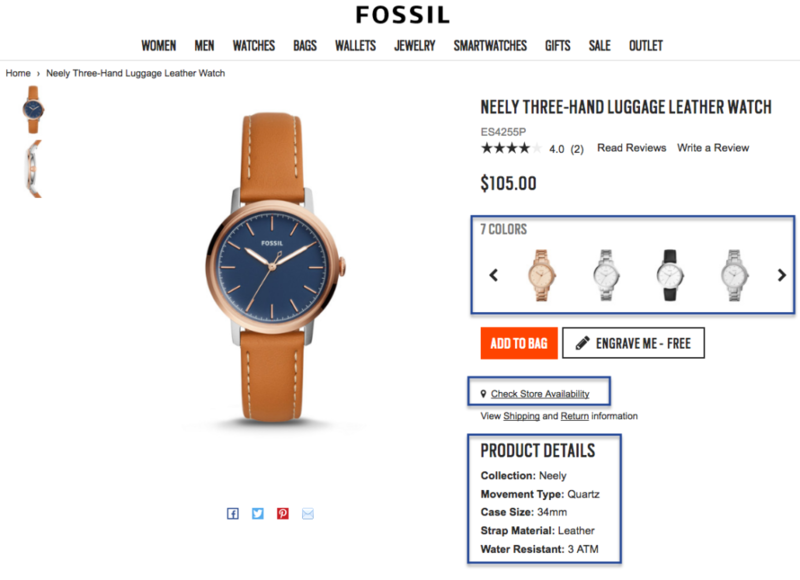 This is the reason why it is usually in a contrasting color.It is an action button that invites the customer to complete the shopping, usually using the verbs such as buy, add to cart, order, etc. Order information is another field that can be used to improve the customer experience. With this option, you enable customers to provide additional information about the order, as well as to monitor the status of their order. These features are commonly used as integration with the e-commerce platform. Order notes which can be customized – This way the users write comments or specify any information related to their order. Tracking the order – An additional integration can enable customers to track their order status, from the moment they have paid for until the item is delivered. A shopping cart is a software that allows the internet users to browse and eventually buy the product by putting it in a virtual basket. Adding a product to cart means that the customer is interested in buying that product, but he or she will continue purchase once they are finished with browsing the website. Besides storing product information, shopping cart also represents a direct link to the checkout process, where the user actually starts the process of purchasing. This cart is provided by the third-party company that provides the solution that is fully hosted on their own servers. They are in charge of system maintenance as well as upgrades. While these might be advantages especially desirable by beginners in e-commerce, a hosted shopping cart involves customers being directed to another domain for payment processing. This is a drawback since changing domain might create a bit of distrust among the customers. Still, this solution is a recommended option for beginners because it is cheaper than the second solution and it demands less time for management. On the other hand, having a licensed shopping cart allows more flexibility and customization options, allowing you to tailor the shopping cart based on your needs. Although this is a great plus, a licensed shopping cart comes with higher costs, and it usually requires more technical knowledge for implementing and fixing potential issues. As shocking as it might be, but over 69% of customers will put something in a cart on your website and leave without purchasing (Source). It is an extraordinary percentage of lost sales, and this evidently has an impact on your business. Just imagine how your revenue would spike if you could actually retain these customers. The most common reason for abandoning the shopping cart is the extra costs. In fact, over 60% of customers have abandoned the shopping cart due to costs such as shipping cost, tax, fee, etc. 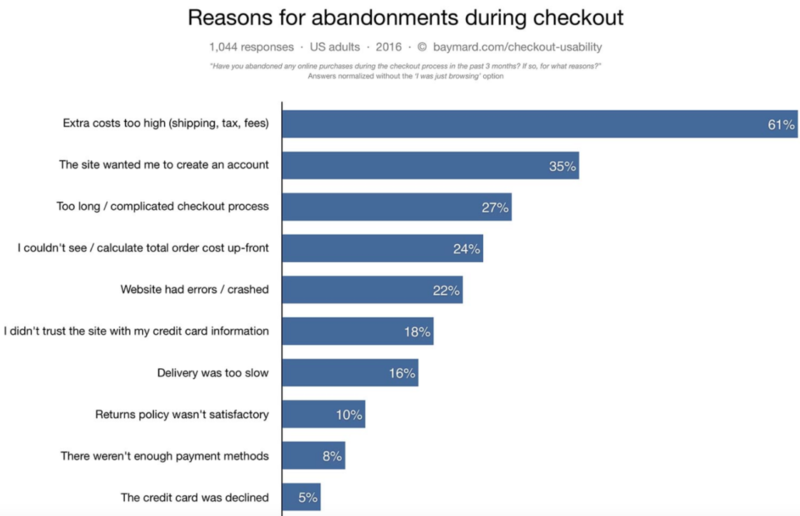 More than one third of customers (35%) say that they have abandoned the cart because they were required to create an account. This is an extra step for them, and if they were in a rush to complete the purchase, this would only slow them down, especially if they were on their mobile device. Too long or complicated checkout process, inability to calculate total order cost up-front or website errors are other common reasons for the customers to abandon their carts. Being aware of all the issues that can be causing shopping cart abandonment helps you optimize your website and the buying process in a way that you maximize the percentage of completed purchases. For starters, allow users to buy without registering an account. 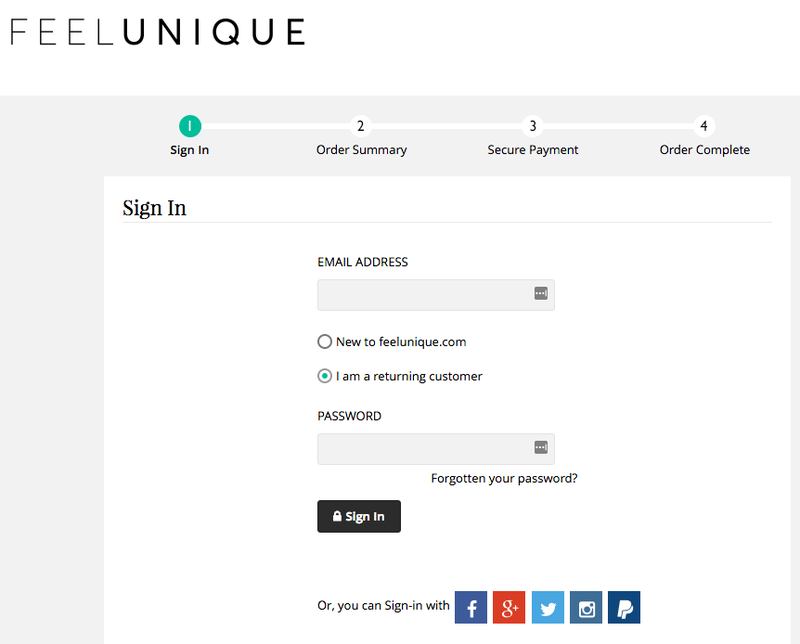 Instead, enable the customers to process through the checkout with their email address. Not only are you going to save them time, but you are also going to obtain their email address early on before they go on to the checkout, where they might still abandon the cart for some other reason. All of the items that have been put in the cart are visible here. The list can be edited, so the customer can increase the quantity of the products or remove the products from the cart. Next to each product, there is a price, and the page will also contain the total price. Apart from the actual product price, the price can include taxes, fees or shipping costs. 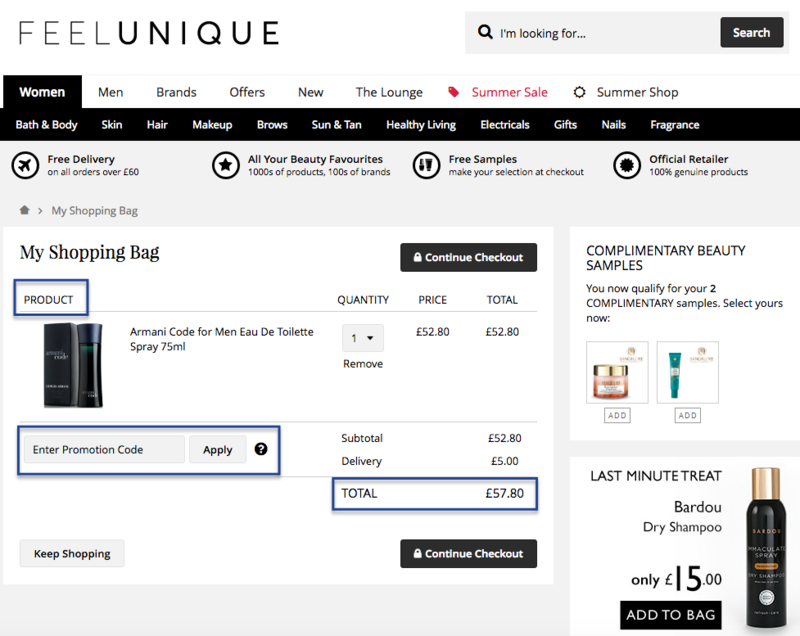 Some e-commerce businesses offer discount codes, and you can provide them on this page. The price will automatically be recalculated. During this phase, the customer will also learn about shipping costs and shipping methods that are available. Since shipping costs are the most common reason for shopping cart abandonment, you could think about offering free shipping. A commonly used method is to provide free shipping on purchases that are over a certain limit. 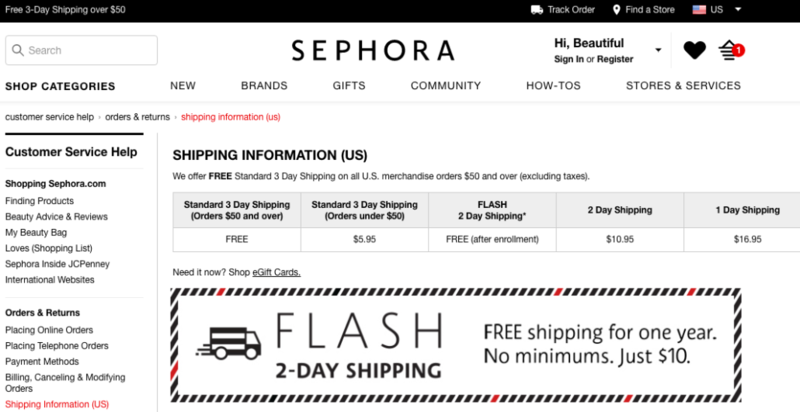 For example, if the customers buy products in the total worth of over $50, they are eligible for free shipping. Not only do you provide a special perk for you customers, but this practice also encourages customers to spend more in your store. Have in mind that free shipping is free for the customer, but your business will have to cover the costs of shipping which depend on the packaging, carrier, insurance, tracking service, etc. All of these influence the shipping costs, and you have to calculate whether you are able to offer free shipping to your customers. Shipping is another major distinction between an offline and online store. Customers are not able to see the products, nor to collect them, but instead, the seller is responsible for delivering the product to the customers. However, the situation is far from simple. In fact, shipping can become quite complicated for e-commerce businesses which is why you have to come up with a plan and strategy on how to handle shipping. There are several shipping models you can use in your e-commerce business. Choosing which one of these to use is based on the type and size of the business you run. The first option is the situation where you send products from home. You are in charge of writing labels and packaging the product. When it comes to sending the packages, you can walk to the post office yourself and send the package or you can have a courier pick up the packages from you and deliver them to the customers. This option refers to using a warehouse to accept and process all the orders. You have the full control of the inventory, and you are able to create a much more consistent shipping strategy. This allows delivering products more quickly and more efficiently. Both of these situations are shipping models where you send the actual product. However, there is a third option which is called dropshipping. This model is a business model where you do not keep the product in stock. Instead of doing so, you collaborate with the suppliers who actually send the product themselves on your behalf, with your own packaging and brand. As a seller, you purchase the product, but you never actually handle it, because the supplier will be responsible for fulfilling orders and delivering the products to the customers. The benefits of this model are lower investment, flexible location and a wide selection of goods. However, it can be more difficult to calculate shipping costs due to a large number of suppliers, and it also might lead to inventory issues and delivery errors. Instead of offering free shipping, you can use carrier services, in which case you would provide this as an optional shipping plan. When you connect your checkout page with services such as FedEx, you can offer real-time rates to your customers. Customers are also presented with the time needed for the delivery using each of the services, as well as the price for each service, which is then added to the total price in the shopping cart. Another alternative when charging shipping is to offer flat rates. Defining flat rates means that you determine the shipping price that will be applicable for all the products on your website. This price can sometimes be over or under the actual shipping price, but it is a great way to predefine the shipping strategy and make sure you charge all the customers the same. Additionally, when forming flat rates, you can define different rates for certain package weight. This means that there would be one price for all the packages up to 1 kilogram, then you would change the price for the packages up to 2 kilograms, and so on. The buying process ends with the payment gateway. A payment gateway is a services that processes payment for an online business. It is integrated into your website as an additional software. This software facilitates the transaction by transferring the information from the customer to the bank. This service basically handles and authorizes the payment between the seller and the buyer. Once the checkout process is complete, and the customer is ready to buy, the payment gateway is activated which is where the customer will make the transaction safely. The process goes like this. Web browser encrypts the data which is sent to the payment processor used by the bank that handles the payment. The transaction data is sent to the card association to the bank issuing that card to authorize the transaction. Once this authorization is received, the payment can be processed, and the approved response is generated. This process actually happens in a few seconds. The benefit of using such software is the that the process filters out possible frauds. This provides an additional level of security to the customers. Online payment processing can be a little intimidating for them, especially if it is the first time they are buying from you. The customers can be scared to share sensitive information such as the credit card number with someone they are not familiar with. Using these services can increase their trust because these services are trusted payment gateways in the online world, and the customers are willing to share their data this way. In fact, they most probably have done so already through previous payments. In this case, your website does not actually collect any data related to payment, such as the credit card number because the service will do this process for you. An additional perk of these services is that they can calculate taxes which are applicable in particular countries and they also convert currencies based on the valid rates. These services usually offer the service for free, and you pay based on the number of transactions. This fee can vary, and it depends on a number of factors, such as the number of monthly transactions, the membership plan you are using, your location, etc. To calculate these costs and to add them to your business plan as a fixed expense that you will have, it is recommended first to choose the service and then look into the estimated rates for your business. The final part of designing an e-commerce website is website security. Since you expect the customers to buy from you, during which they will go through the payment process and payment gateway, you need to think about security on your website. Firstly, there is something called Payment Card Industry (PCI) Security Standards, which is how industry standards are defined to safeguard payment data before, during, and after the purchase. These standards have to be followed on your server, in the shopping cart, and throughout the payment gateway process. Since you are using third-party services for all these aspects of your business, you have this part of website security covered because those services are already PCI compliant. SSL (Secure Sockets Layer) is the security standard that establishes an encrypted link between a web server and a browser. This means that all the data that passes between these two is encrypted and it will remain private and integral. This protocol is used by HTTPS pages to encrypt communication and keep the data protected, which is why it is recommended to have SSL certificate activated on your e-commerce website. Furthermore, customers are more likely to trust HTTPS websites which will encourage them to complete their purchase.